Despite these challenges, the three Deans have remained committed to being role models for their students and to building upon their predecessors’ legacies. Dean Hor, for instance, has striven to impress upon his students the need to have worthy ideals, like integrity and professionalism, and the tenacity to never lose them, while Deans Gane and Howells have remained visibly committed to promoting academic excellence and enhancing the interchange between universities and the profession. Sitting poised at the roundtable to address current issues that their institutions and faculty face, each Dean appeared to brim with confidence in his own and his faculties’ ability to meet them. 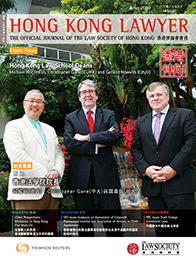 As the conversation began to unfold, each also appeared committed to raising the international profile of his law school and thereby the prestige of the legal education system in Hong Kong. One perpetual challenge of being a Law School Dean is ensuring the methods by which law students are trained evolve to meet the fluctuating needs of the profession. During the roundtable, the three Deans all agreed that more could be done in the “academic” stage of training – the LLB or the JD – to make sure the skills law students learn are relevant to the needs of the profession. Dean Gane wants to see law schools better ensure that career choices available to students holding law degrees are advised and supported regardless of the direction students may wish to pursue after graduation. “While most students who have undertaken a University degree in law will consider using that degree to enter the legal profession that is by no means true for all students,” he says. Independent Review of the PCLL: Is this Historic System Still Workable? Another complex issue percolating in the legal education system concerns the quality and consistency of the different PCLL programmes. Each law school offers a one-year full-time PCLL course that ends with a final examination to qualify law graduates before they can become trainee solicitors or barrister pupils, but each law school has a degree of control over the design and operation of its PCLL programme. The Standing Committee on Legal Education and Training, chaired by Mr. Justice Patrick Chan, will soon commission an independent review of the legal education and training of lawyers, which will include a review of the different PCLL programmes. The three Deans hold similar views about the consistency and quality of the examinations their schools administer, as well as how any deficiency might be addressed. They also appear to take similar positions with respect to the Law Society’s proposal to replace their tests with a centralised qualifying examination that would be administered by the Law Society. Another challenge the Deans face is developing and implementing an effective research strategy, as the research each of their publicly-funded institutions produce is periodically evaluated by the University Grants Committee (“UGC”) through its Research Assessment Exercises (“RAEs”). Since 1993, the UGC has conducted five RAEs (1993, 1996, 1999, 2006 and 2014). The overarching objective of the RAE is to assess the research quality of UGC-funded institutions and to encourage world-class research. All assessments in the RAEs are based on the merits of the submissions, not on individual staff. The quantity of submissions is not an assessment factor. In a 27 January 2015 press release, the UGC indicated that the RAE 2014 produced quality profiles of the eight UCG-funded institutions, including the three law schools, and identified areas of relative strength and areas that could be further improved. The RAE 2014 results will be used to inform the distribution of part of the Research Portion of the UGC Block Grant to the eight institutions. However, the actual allocation of funds under the Block Grant (about $17 billion in 2015/2016) is determined by institutions internally, as they see fit. As the Deans discuss the RAE 2014, their conversation teases out a felt tension between relying on well-established assessments that command confidence and the ability to ensure a broad range of research can flourish in Hong Kong. Each Dean differs in his views on the benefits and limitations of the UGC’s RAEs and explains how his law school plans to move forward in response to the RAE 2014 results. While Dean Hor took no issue with the results, and even commended the Law Panel of the RAE 2014 for doing a remarkable job in assessing the output of the three law schools, he pointed out an important difference in the Hong Kong RAE panel compared to the United Kingdom’s Research Excellence Framework (“REF”) 2014 panel. The UK panel was comprised of academics from the UK, while the Hong Kong panel had only three Hong Kong members and seven members from Australia, the UK and the United States. Without intending to criticise the work of the RAE 2014 panel, Dean Hor felt that having more members from Hong Kong may have been more appropriate since many of the outputs concerned legal developments in Hong Kong and mainland China. CityU has scholars publishing at the highest levels; however, Dean Howells says that CityU certainly wants to enhance its profile. “There are signs this is happening with several important grants being awarded last year. We also have a development strategy for staff, and our strong recruitment post-RAE is aimed at ensuring a healthy research community,” he adds. As the roundtable came to a close, the Deans were asked to reflect on what they were doing to build upon the foundations laid by their predecessors. Dean Gane indicated that he has committed himself to attracting high-quality academic staff, reviewing CUHK’s academic programmes on a systematic basis and taking steps to provide additional support for CUHK’s Research Post-graduate students, among other things. Dean Howells says he is working diligently to deepen CityU’s links with the profession and build stronger ties with leading laws schools in foreign jurisdictions, while Dean Hor says he is focusing his efforts on building up HKU’s Faculty expertise in both common law and Chinese law, in hopes of better immersing students in Chinese law. Dean Hor also notes that HKU has launched a Judicial Studies Programme, which hopes to begin and sustain a dialogue on all matters relating to Judges, Courts and Adjudications between the Faculty and retired and sitting Judges and judicial administrators in Hong Kong, China and other Asian jurisdictions through workshops, symposia and research projects. Another area the Deans show interest in, and also note the importance of, was the need for increasing the level of participation of females in senior university positions to act as role models for the future generation. Dean Gane observes that there are many very able women academics out there – and not necessarily just in Hong Kong, but concedes that he does not know why Hong Kong has not yet managed to appoint a woman to any Deanship position. Continuing on this point, he notes that the number of women in any senior academic position in Hong Kong is pretty low. Dean Howells says he is delighted that CityU is attracting female candidates of the highest quality, but indicated that his law school needed more senior female faculty, generally, and should increase its efforts to encourage existing female faculty members to play a role in the management of the school. Also in agreement, Dean Hor concluded that he would like to see a woman Dean of Law as soon as possible, as a woman Dean would bring a refreshingly different perspective and attitude towards Law Faculty leadership. Any building process is only as good as its foundations; the profession and all its stakeholders in Hong Kong look on with much expectation for the future. Michael Hor studied law at the National University of Singapore, the University of Oxford and the University of Chicago. He decided on an academic path and joined the Faculty of Law of the National University of Singapore, where he was to remain for 27 years, teaching and researching in criminal law, criminal process and evidence. He joined the Faculty of Law of The University of Hong Kong in 2014 as Dean. He is very excited about the opportunity to contribute to the already remarkable achievements of his new found institution. Geraint Howells is Chair Professor of Commercial Law and Dean of the Law School at City University of Hong Kong; barrister at Gough Square Chambers, London (though not currently practising) and former President of the International Association of Consumer Law. He previously held chairs at Sheffield, Lancaster and Manchester and has been head of law schools at Lancaster and Manchester. His books include Comparative Product Liability, Consumer Product Safety, Consumer Protection Law, EC Consumer Law, Product Liability, European Fair Trading Law, Handbook of Research on International Consumer Law and The Tobacco Challenge. He has undertaken extensive consultancy work for the EU and UK government as well as for NGOs. Professor Christopher Gane was appointed Dean of the Faculty of Law of the Chinese University of Hong Kong in September 2011. Prior to coming to the Chinese University of Hong Kong he held the Chair of Scots Law at the University of Aberdeen where he was Dean of the Faculty of Law from 1995 to 2000. In 2004, he was appointed University Vice-Principal (Pro Vice-Chancellor), and over the next seven years, was responsible for a number of strategic portfolios, including Library and Information Services, Culture and Communities and Equality and Diversity. In 2008, he was appointed Head of the College of Arts and Social Sciences (which comprises the Schools of Business; Divinity, History and Philosophy; Education; Language and Literature; Law; Social Sciences). His research and teaching interests include domestic Criminal Law and Procedure, International Criminal Law and Human Rights.